While writing The Reengineers, I had always thought of the above quote from Four Quarters as its epigraph, before settling for the quote from Dickens. 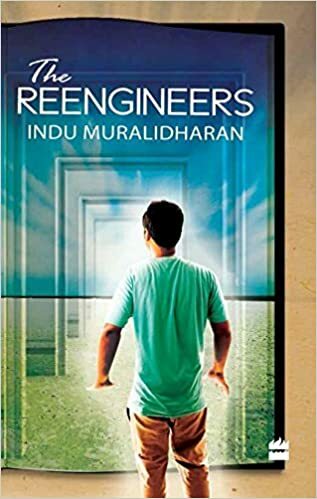 The hero Chinmay’s adventure begins when he steps out from one library to another, and encounters a man who is likely to be his author. The much loved lines from Eliot were symbolic of the surreal adventure of Chinmay and his friends. In the scene in Chapter Nine where Chinmay and friends sit listening to a conversation between Siddharth and Nivedita in which Siddharth refers to Amrita as ‘a phantom of delight‘ and when Nivedita tells him that ‘Amrita had her feet too firmly on the ground to be a phantom of any kind, and besides it was old fashioned to quote Wordsworth‘, the original scene extended to Siddharth replying that quoting Prufrock would suit Amrita better as she was a doctor, and reciting the poem afterwards. I removed both these references during the book’s final edit, but in the vision of the book in my mind, these lines from Eliot remain an integral part of the novel. The protagonist Tom Richards in Muriel Spark’s novel ‘Reality and Dreams’ is conscious of the first line of Prufrock running through his consciousness throughout the novel, ‘Let us go then, you and I.’ While Prufrock is in a dream from where he states that he will remain ’till human voices wake, and drown him‘, Tom feels that he is in ‘no man’s land between dreams and reality’. Reality and Dreams is not one of Spark’s greatest works, what remained with me as a reader was the line from Eliot which threaded the novel’s narrative and premise together. Studying Eliot is enthralling. As a modernist writer, as a philosopher poet, as an experimental playwright, there are so many layers into his work. “Our civilization comprehends great variety and complexity, and this variety and complexity, playing upon a refined sensibility, must produce various and complex results. The poet must become more and more comprehensive, more allusive, more indirect, in order to force, to dislocate if necessary, language into his meaning.“, says Eliot in his review of Metaphysical Lyrics and Poems of the Seventeenth Century: Donne to Butler. Selected and edited, with an Essay, by Herbert J. C. Grierson (Oxford: Clarendon Press. London; Milford) in the Times Literary Supplement, October 1921. For the past three years, I have found myself reading Four Quartets afresh in mid-April, on every Tamil New Year, it has almost become a tradition. There is one more reason to love Eliot, his delightful ‘Old Possum’s Book of Practical Cats’. Here is a link to him reading ‘The Ad-ressing of Cats’. A poet who loves cats is one after my own heart.